Or rather, "calling out around the Bush, are your ready for a brand new beat?" After I posted about Oxjam's Shepherd's Bush Takeover I received an email from one of the lovely volunteer organisers with some more information. They are also calling out for your help and involvement. Yes, you! Like Bushstock the Oxjam Takeover will be a one day event, complete with festival-esque wristbands, where multiple venues around the Bush will be hosting not only musical acts but also comedians and DJs for our entertainment. Though the precise date of the event is yet to be confirmed several venues are already signed up: The Defectors Weld, Goldhawk, Walkabout, Vesbar and Raving Buddah. With many more still to be added it's looking like it will be quite a day in the Bush. So at this early stage in the game Oxjam are reaching out for the talent and all the better if it is local Shepherd's Bush talent. 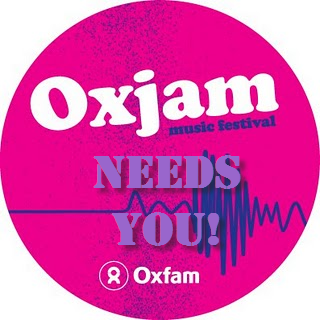 If you're a musician, boy/girl/man-band member, comedian, DJ or other type of performer (the mind boggles) the please get in touch with Oxjam Shepherd's Bush via their Facebook page or Twitter. They are also very keen to hear from potential local sponsors and of course local volunteers who are keen to help out. Oxjam is mainly run by brilliant volunteers so they are on the look out for extra pairs of hands and if you'd like to email me, I'd be happy to put you in touch.